Mya Kerner; 2013; Cast Iron; 22" x 72" x 2". SOLD. Mya Kerner; 2013; Cast Iron; 24" x 96" x 2". SOLD. Mya Kerner; 2014; Found Steel on Panel; Each 9 1/8" x 6 1/2" x 1". During my residency at Sloss Furnaces National Historic Landmark in Birmingham, AL, a new building was under construction. When the earth was moved for the establishment of the new foundation, countless artifacts were unearthed. 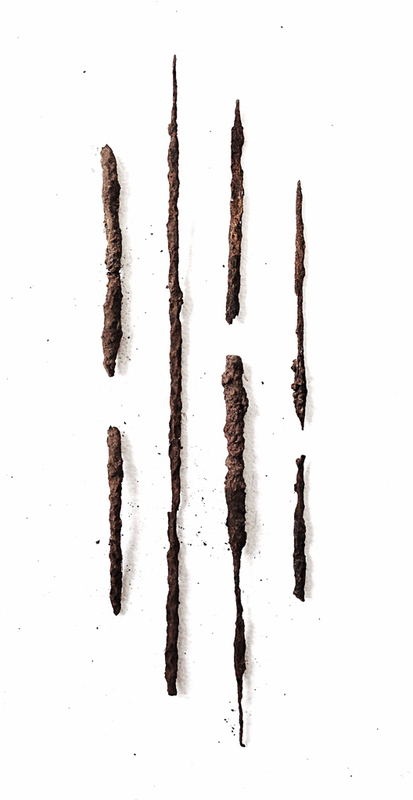 In the dirt and rust I found bits of corroded steel cable which I collected and stored in my studio. Once my collection had grown, I began to order these strands as drawings on panels. These maps were composed through a meditative process outside of the foundry. I consider them maps to my subconscious. Mya Kerner; 2014; Cast Iron, Wood. Permanent Collection, Sloss Furnaces. 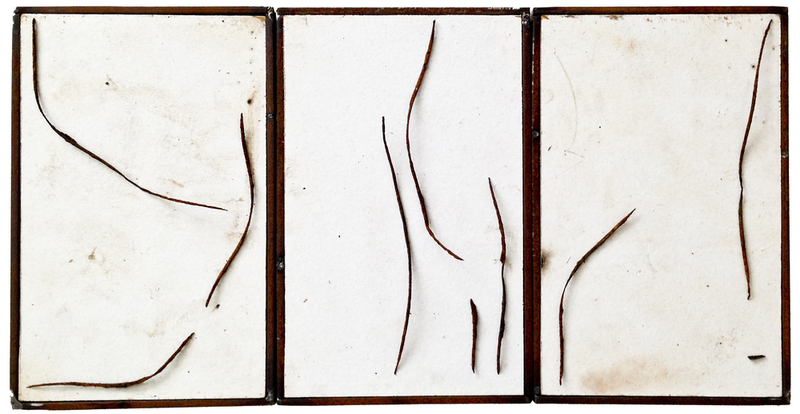 Mya Kerner; 2014; Found Steel on Panel; Each 6 1/2" x 4 1/8" x 1". Mya Kerner; 2013; Found Steel; 5" x 9". SOLD. Mya Kerner; 2014; Cast Iron, Steel; 12" x 48" x 1". NFS. Mya Kerner; 2014; Found Steel on Panel; 6 1/2" x 8 1/2" x 1". Mya Kerner; 2014; Found Steel on Panel; 28" x 18" x 1 1/2".